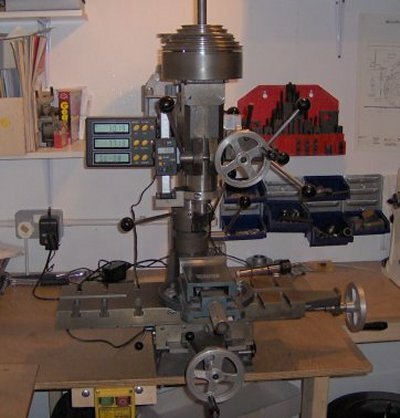 My Dore-Westbury milling machine was purchased without any scales on the handles. So a Digital Read-Out (DRO) System was installed to make accurate cuts possible. One advantage of the DRO system was that its accuracy was unaffected by backlash in the leadscrews. 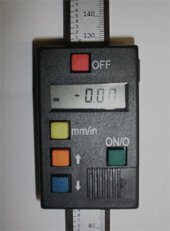 The Z-axis unit was a vertical type. 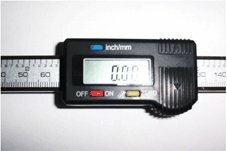 The linear scale part of the unit was attached to the spindle using a simple clamp. The readout part of the unit was attached to the body of the mill using a right angled bracket. 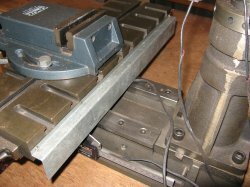 The end of the linear scale had to be cut to stop it fouling on the pulleys at the top of the machine when the column was fully retracted. The best technique for cutting the hardened scale turned out to be a cutting/grinding wheel on a small power tool such as a Dremel. The X-axis scale unit was mounted at the back of the table. The linear scale was mounted at both ends on to the moving part of the table. The readout part of the unit was screwed to the fixed part of the bed. To prevent damage this scale unit was covered by a metal shield. 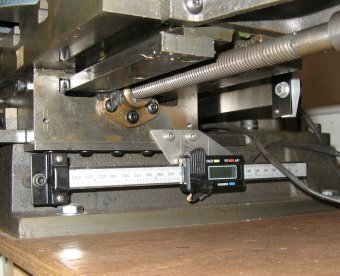 The Y-axis scale unit was mounted under the table on the right hand side of the mill. 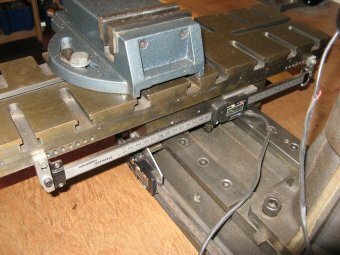 The linear scale was fixed to the mill bed and the readout part of the unit was attached to the moving part of the table. 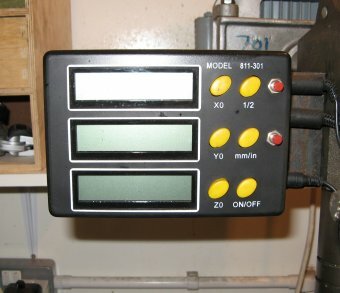 The readout was offset towards the back of the machine to allow the full travel of the Y-axis to be used without the scale limiting the movement. The wiring used on the scale units is shown on the right. This diagram also shows what signals were used on each of the contacts. 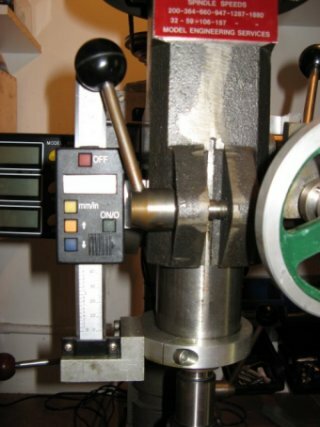 This system of DRO's made the milling maching much more useful but there were a couple of problems. One problem was that the scale unit update was not very fast - only about 3 times a second. This was OK for co-ordinate drilling but was a problem when taking a continuous cut. The update was simply not quick enough to give a real-time position. Slower cuts helped but this could lead to rubbing of the tool. However it was discovered that the scales could be switched into a faster mode by shorting out the clock signal with the +V signal. However this had problems too because in this mode the scale would not zero. 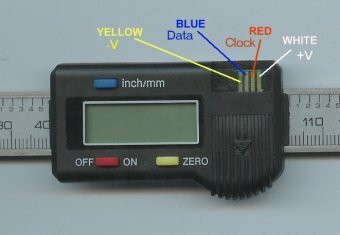 In the end 2 momentary contact buttons were added to the remote readout to enable it to switch the scales between fast and 'zeroable' modes. Another issue was that both the X and Y scale units used up batteries very fast. Even switching the scales off didn't help - in fact the remote reader would still show the reading with the scales switched off so the off button seemed to only switch the local display off. An attempt was made to connect the units to a 1.5v power supply but this made the reading 'wander'. 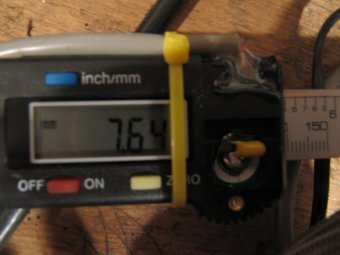 Only when a smoothed power supply was used with screened cables and a 22uF capacitor bridging the battery contacts, did the system become stable. Other engineers have been in touch to report problems obtaining a stable reading from these systems, particularly when batteries were anything but fully charged. One also reported that using the light switch and turning the mill motor on, would also make the scales jump. Since the document shown here was written, the market has become populated with other scale units, some of which use different protocols and some which use USB connections. These may not be compatible with the ideas shown here. The original system eventually got damage and so some replacement units were purchased ensuring that they looked the same and had the same contacts. These were wired in and worked OK, but unfortunately the additional fast/slow modification no longer worked. 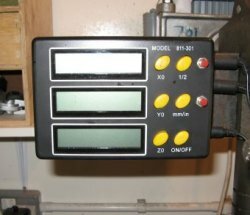 Although this part of the system had not changed, pressing the fast/slow mode button now put the scales into a 'hold' mode freezing the output. So the new scales could only be used in slow mode which was a significant downside.